While historically, pirates were often cruel and murderous notorious criminals, today's culture has popularized and romanticized them. Movies, literature, video games, cartoons and even the "International Talk Like a Pirate Day" have given pirates new appeal. For those creating comedic skits for anything from professional performances to Scout meetings and classroom lessons, pirates may be a fun and creative topic. Find inspiration in pirate-specific language, setting, characters, action, props and costumes. People today associate a specific dialog and language to pirates, which may be mined for pirate skit ideas. Incorporate jokes into a comedy sketch that take advantage of pirate accents and the emphasis on rolling "R"s. Have a captain in a campfire sketch order pirates to walk "da plank," only to have a reveal at the end that his dog is named Daplank. Turn sea shanties and pirate songs into skits with participants acting out what the lyrics describe. Create a skit in which two people attempt to communicate -- one speaking as a pirate and the other not understanding at all. Build your pirate skit around a particular setting that pirates frequented, whether it be on the ship itself, a port, a deserted island, a lifeboat or a cave filled with treasure. Have skit participants on a ship walk in exaggerated manners that show the rolling of the sea. Build a skit around the entering of a cave filled with treasure only to have the treasure be something unusual, funny or perhaps anachronistic, such as a Sid Meier's "Pirates!" game or a soundtrack to "Pirates of the Caribbean." Write a skit about a pirate on a seemingly deserted island in which there is a bustling resort on the other side. 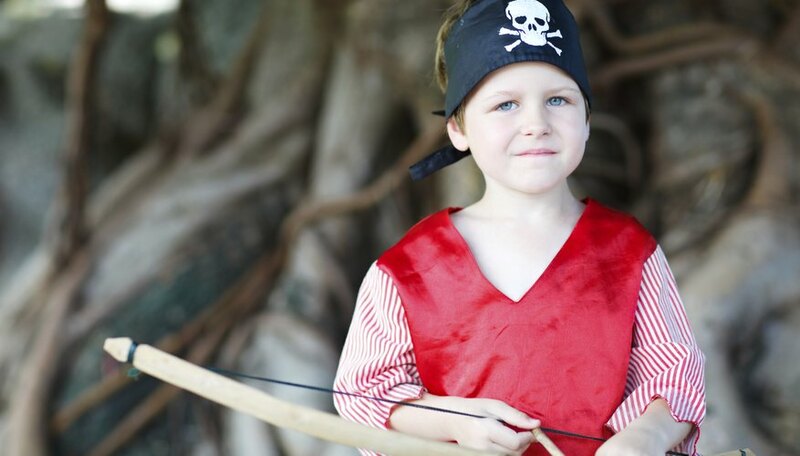 Create skits around real-life pirates or pirates out of legend or popular culture. Take fearsome pirates such as Blackbeard, Calico Jack, Anne Bonney, Mary Read, Madame Cheng or Captain Kidd and find something humorous about their lives or a way to turn something serious into a comedic bit. Change the name slightly so it has an element of comedy. Have the pirate meet someone from contemporary times, perhaps a celebrity rock star or an actor who has played a pirate. Introduce the two characters and have them each try to one-up the other. Incorporate pirate-specific action into your skits. This might include mock sword fighting, swabbing a deck or walking a plank. Take a scene from a popular pirate movie and alter it in a satiric manner or create a parody of it. Have participants mime an action that looks like one thing, such as climbing a rope ladder or pulling in a net, only to have it be revealed it is something else. Have two pirates deep in conversation who have to perform an action such as falling to their stomachs every time someone calls out "hit the deck" or duck when someone says "lower the boom." The catch is they must continue their conversation normally as if nothing happened. Incorporate props or costumes to give a skit a pirate flavor. Figure out ways to use things such as parrots, eye patches, hooks, leg stumps, a Jolly Roger flag or a plank. Have an actor show up for an executive interview wearing a tricorn, striped stockings and a pirate jacket, and proceed to give pirate "accomplishments" in response to interview questions.